Australian nurse Helle Poulsen-Dobbyns has just returned from Maiduguri – capital of Borno State in north-eastern Nigeria where she was the program coordinator for Médecins Sans Frontières. Helle Poulsen-Dobbyns has had more than 30 assignments in the field with Médecins Sans Frontières. She explains how malnourished children were flooding into our medical facilities in a region affected by the conflict between Boko Haram and the Nigerian army. What is the situation in Maiduguri? Our teams were confronted with huge numbers of acutely malnourished children and an increasing number of malaria cases. In some locations malnutrition rates were as high as those recorded in the conflict zones. We had both types of severe acute malnutrition (SAM): severe marasmus or wasting, and kids with Kwashiorkor (swellings of fluid known as oedema occurring on the child’s ankles, feet, and belly ), but so bad that their skin developed boil-like eruptions, as if they had suffered burns. When we conducted food distribution in a camp, it was the first food these 8,000 people had received in four months. "When we conducted food distribution in a camp, it was the first food these 8,000 people had received in four months"
What were the main difficulties? Our triage was overwhelmed by the number of children under the age of five; they are the most vulnerable. Also, our patients would develop severe malaria on bodies already weakened by malnutrition, and were thus not able to fight off disease. That’s why I kept telling the team “it’s all about food.” To have a targeted impact we established criteria for who should receive the food. For example, for children discharged from the Inpatient Therapeutic Feeding Centre (ITFC), we give their mothers a family ration of one-month’s food supply so that that their children wouldn’t succumb to SAM again. We also do a targeted food distribution to families with six or more children and with at least one child under five. This is not replacing the food distribution that would be needed for the internally displaced people living in camps or in the community. Furthermore, 90% of the displaced people in Maiduguri are in poor conditions: inadequate sanitation and hygiene. It’s making it harder to reach to them and such conditions are like an incubator, spreading disease. How is Médecins Sans Frontières responding to the emergency? To deal with the influx of patients we first started recruiting new staff who were trained for the huge number of new emergency cases. Then we worked on the management of our medical facilities. For example, in our Maimusari clinic, we have nurses triaging within the patient queues, to ensure prompt identification, which would then allow us to give the necessary care to the most severe cases. The children were so sick, the risk of them dying while waiting was high. 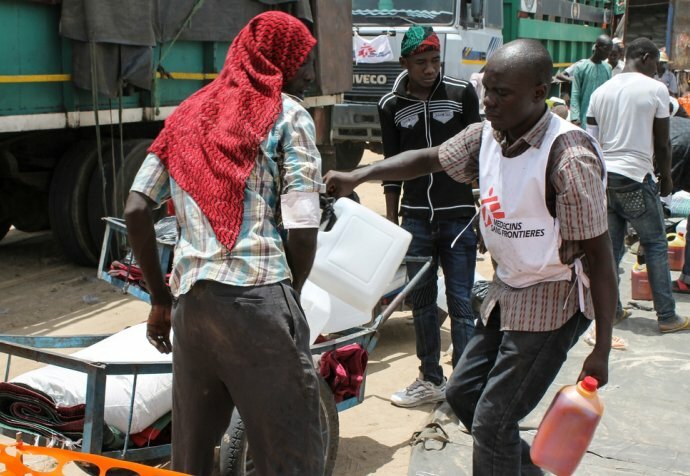 We maintain a comprehensive intervention in the camps in Maiduguri and outside through a four-day distribution campaign of food and non-food items like mosquito nets, jerry cans, mats, blankets and soap. We ran a mobile clinic simultaneously, doing medical screening as well as treating systematically, and giving preventive treatment like measles vaccination and seasonal malaria prophylaxis. What are your main concerns for the future? The rainy season has been short, with little rains, so it’s created the optimum conditions for mosquitos to develop in small water pools. People have missed the rain and therefore the planting season. Their villages have been destroyed, livestock stolen, fields and crops looted and torched. Furthermore, when the hot season comes the whole population will still be weakened by malnutrition as well as exposed to the massive risk of malaria, exacerbated by the crowded conditions. This crisis is still unfolding and there must be a comprehensive and collaborative approach including food distribution by aid agencies and authorities. 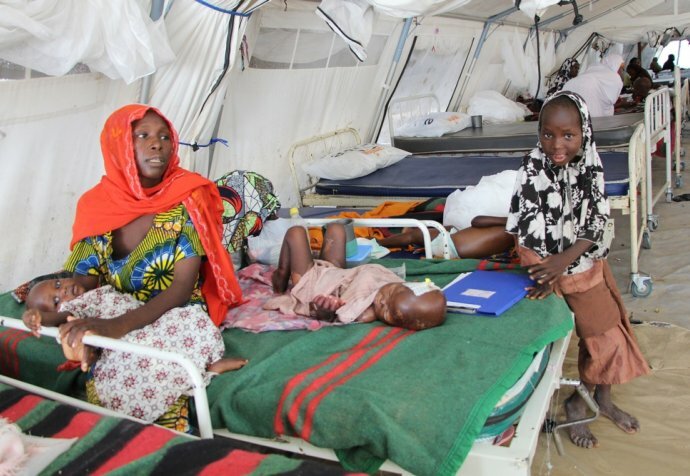 Médecins Sans Frontières has three projects in Maiduguri. In Gwange there is a 102-bed ITFC where we hospitalise the children with SAM and complications. In Maimusari an inpatient department (IPD) and outpatient department (OPD) to provide care to malnourished children in their community with an Ambulatory Therapeutic Feeding Centre (ATFC). We’re also providing safe delivery care. Our emergency obstetrics cares for mothers and their newborns, whose lives are most at risk around the time of birth. In Bolori we provide general health services and nutrition care in an OPD and ATFC, as well as emergency obstetrics.